Mary ‘Polly’ Bayliss was baptised on 12 March 1843 in Campden Parish Church and was the second of William and Eliza Bayliss’s seven children. Her father was a professional soldier who reputedly fought at Waterloo. His army papers stated that he had served in America, France, New South Wales, East Indies and at home, a total of just over 25 years service. Polly married John Waine in 1861 and they had two daughters, Ann (who died at 12 days) and Sarah Minnie, who married George Taplin and had two sons and two daughters. About five weeks ago a gang of men were mowing a field belonging to Mr Matthews near to Campden, they were allowed beer and having nearly finished the job they sent a man named John Waine, one of their number, for more beer. He appears to have loitered by the way, and his companions supposed that he had been drinking more than his share before he returned and accused him of it. This caused a quarrel and John Waine being then drunk struck his own father, who was one of the number, and who interposed to prevent the others fighting. The old man fell and received an injury to the spine, from which he never recovered, but died on Saturday last. A post mortem of the body took place under the direction of Joseph Lovegrove Esq, coroner for the County, and after a patient investigation the Jury under his direction found a verdict of manslaughter against John Waine, the son, and a warrant was issued for his committal to Gloucester, the witnesses being bound over to appear. He had been previously apprehended but the father being unwilling as well as incapable of appearing against him, he was discharged and was at large at the time of the inquest, which was held on Tuesday last. Polly Waine appeared before Campden Magistrates in May 1871, accused of being a quarrelsome neighbour. Polly was aged 28 at this time and the family was living in Sheep Street, but by 1881 John was the innkeeper at The Rose and Crown pub in Lower High Street; apparently his conviction for manslaughter whilst drunk was not held against him. Later they moved to Poppetts Alley where Polly used her front room as a sweet shop. She was proud of her father’s war record and particularly his presence at Waterloo, but recently it has been shown that the printed word ‘Waterloo’ on his papers had been crossed out. His regiment was not at the battle and he did not get the extra years’ pension. Luckily no-one discovered this then to spoil her story! She was known for wearing a long black costume, even when dress styles changed after WWI. Later her cape and hat were donated to the CADHAS Archives. 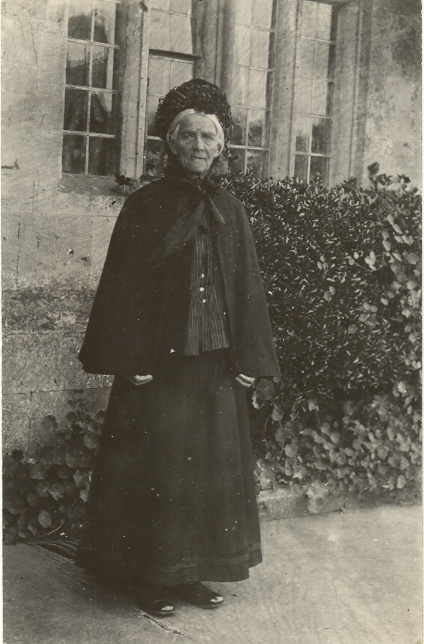 Polly was a well-known Campden character in her later years. Her husband died in 1917 and in 1926 aged 83 she moved into no. 9 Almshouses, where she stayed until near her death. The ‘star’ of the evening will be 93 year old Polly Waine, whose father fought at Waterloo and who still has his discharge certificate in her drawer in the almshouses … ‘I expect I can answer a few questions,’ she declared confidently, ‘I can talk alright.’ And so she can. The producer, Owen Reed, was rather concerned at the rehearsal for the live performance because she talked a little too much. Perhaps he upset her then, because when they went to the Almshouses in the evening she would not open the door and the broadcast had to go ahead without her. An accident befell Mrs Polly Waine, of The Almshouses, Campden, when she fell and broke a leg on Wednesday. Mrs Waine is 96 years of age – a Campdonian by birth and is Campden’s oldest inhabitant. Considering her great age she is hale and hearty and took her daily walks about the town shopping etc. up to the time of the accident. She is confined to bed at the residence of her daughter, Mrs Taplin, as a result of the accident. Polly Waine died later that year, in November. Polly Waine was my great great Aunt. My Mother spoke about her often.